RG6 Coax – 6dB @ 100 ft.
RG59 Coax – 10dB @100 ft. Even if ports are left unused on a splitter, there is still the same amount of signal loss. 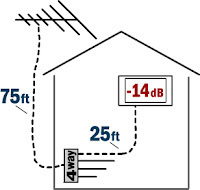 In the diagram the RG6 cable length totals 100ft on the longest run for -6dB. The signal also passes through a 4-way splitter where it gets reduced by 8dB, totaling 14dB at the TV. 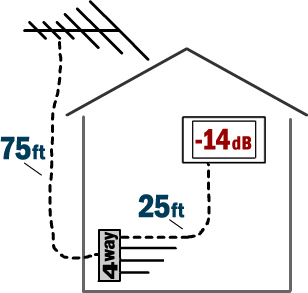 Any pre-amp 14dB or stronger would make up for the signal loss in this home. Gain: This is the most important factor in picking out a pre-amp because you want to make sure your gain is equal to or greater than your signal loss. For instance. If you have 100ft of RG6 cable , which has 8dB of loss, you want to make sure you amp is at least 8dB or stronger. Amps range from about 12-30dB. A warning about high-gain amps. The higher gain amps are not necessarily better. If you only have 15dB of loss on your longest cable run, and you use a 30dB amp, you can overdrive your tuner with too much signal. Noise figure: This is almost as important as the gain. When an amp is added to a system, a small amount of signal noise is generated. The higher the noise figure, the lower the sensitivity of the tuners being used to pick up the signal. Channel Master’s CM7777 is sought after for it’s low noise figure. (Around 2dB on UHF) This is a good noise figure. A high noise figure would be 4-6dB. Frequency VHF UHF FM: This one is pretty simple. If your TV Antenna is VHF/UHF get a pre-amp that passes VHF/UHF. Using a VHF/UHF Antenna on a VHF only or UHF only amp will result in one of those frequencies being blocked. High input: This feature is important for those under twenty miles, who want to make up for cable, but don’t want to overdrive their tuner. The best example of this feature is the HDP-269. FM Trap: FM Traps will strongly reduce FM Signal. 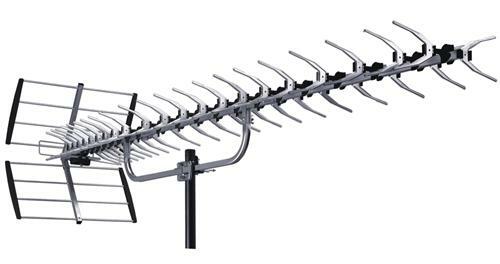 This is used to knock down the signal level of strong local FM stations that may be causing interference to your TV station. FM Traps are either fixed, or switchable. Connection Type: All modern pre-amps have a 75 OHM F-connector, the alternative was a 300 OHM Twin lead cable, but most of those models have since been continued. Dual Input: These amps have two inputs, one for VHF and one for UHF. This allows you to join a VHF and UHF signal with almost no loss.